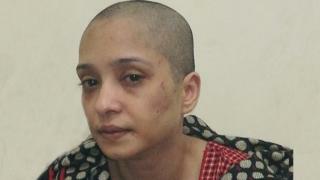 Pakistani woman has publicly accused her husband of beating her and shaving her head for refusing to dance for him and his friends, in a case that has raised new concerns about women's safety in the country, reports BBC. "He took my clothes off in front of his servants. The servants held me as he shaved my hair off and burned it. My clothes were bloody. I was bound by a pipe and hung from the fan. He threatened to hang me naked," she said. According to BBC she said she went to the police to file a complaint but they procrastinated - the police deny the allegation, saying that immediately after Ms Aziz's visit to the police station a team was dispatched to her residence but it was found locked and the DHA management prevented them from entering the premises. BBC also reports that Police acted only after the video came to the notice of Deputy Minister for Interior, Sheheryar Afridi, who ordered officers to register a complaint. In a tweet, Amnesty International said "systemic change" was necessary.